Tiny houses save money — TONS of money: on land, mortgage, furniture, utilities, etc. They’re MUCH kinder to the environment than anything in the McMansion gang. Once you furnish a tiny house you won’t waste a single minute mooning over what new stuff to buy since you won’t have an inch of vacant space to stow it. After-work hours or weekends won’t be shot on boring house maintenance tasks like mowing monster lawns or painting two or three stories or repairing things that break or leak or die (the bigger the house, the longer that maintenance list). And most importantly, once they’re no longer slaves to their homes, tiny house owners will be handed the lovely gift of freedom — lots of time (to go with all that extra money) to do whatever their heart desires. At Msn.com check out the Shotgun Shack, 325 square feet of Arkansas living space that costs a big $20,000 to build. To get an on-site taste of tiny-home living, check in at the 240 square foot Gingerbread Cottage in Canyon Lake, Texas. Costing $60,000 to build, this folksy cottage looks like it’s waiting for Hansel and Gretal to come up the path. And if you’re looking for a house to pack up and go wherever you go, there’s ProtoHaus, a 125 square foot house on wheels. Built with $25,000 of recycled materials, it’s powered by solar panels and propane making it “off the grid” (meaning free of housing regulations and building codes). Designboom.com features a collection of tiny global houses constructed in every shape and size. A standout is Japanese architect Satoshi Kurosaki with his light filled, sophisticated spaces designed for his country’s particularly tight space restrictions. For a Colorado client, architect Stephen Atkinson designed a minimalist cabin with an open concept living area and a covered patio the same size as the home’s interior. Arvesund, a Swedish company, is behind the Hermit’s Cabin, one room with a single bed and kitchen, that wouldn’t have looked out of place sitting on a Gold-rush mountain. Another much larger cabin is actually 2 salvaged metal shipping containers. And for pure fun, a German firm shows off their imaginative, geometrically shaped tree houses made of steel. One of the first companies to deal exclusively with tiny houses, Tumbleweed Houses sells ready-made or do it yourself bungalows and cottages and houses -to-go measuring less than a hundred feet up to a palatial 874 square feet. 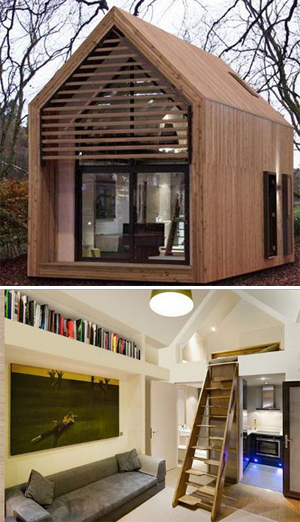 My favorites of these tiny houses are the sleek, more contemporary designs, which seem to be more prevalent overseas. The house pictured at the top here by architect, Richard Frankland is a prefab made by Dwelle and sold only in the UK. Think you could live comfortably in a tiny house? Will Your New Home Unfold like Giant Origami? I’ve heard of tumbleweed and love some of the designs. Way better than an air stream! I could definitely live comfortably in a tiny house. In 2004, when my husband and I split up, I moved into a tiny apartment in San Francisco, about 600 square feet. I was so happy to downsize and fit everything I own into that beautiful small space. I felt like a kitty cat curling up. Sorry for the delay commenting, per my latest post I’m having trouble with my hands, but intend to visit my main buddies as I have time (and relief). I’ve never measured my apartment, but it’s tiny, tiny – befitting the maids who lived here when it was first built. I like living in a small space too – the coziness of it, but it’s really jam packed with all my art stuff. I’ve had to give away paintings I liked a lot simply because they couldn’t be squeezed in.